Early in the 1900s, when trains were the principal means of personal transportation, depots gave travelers a first impression of their local destinations and provided for the security and comfort of the railroad’s clientele. Design and materials were important to both surrounding communities and railroad companies. After the Atchison, Topeka, and Santa Fe Depot at Needles burned in 1906, the railroad spared no expense on its new facility. 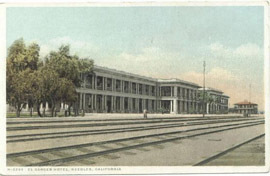 Built to suggest a Greek temple and opened in 1908 to great adulation, El Garces was a freight and passenger depot with hotel and restaurant amenities. The depot took its name from missionary Father Francisco Garces, known as the first European to cross the Mojave Desert. One reason for the success of El Garces was its beauty. Another was its management by the Fred Harvey Company. Known as “the civilizer of the West,” Fred Harvey managed a large line of cafes and hotels along the Atcheson, Topeka, and Santa Fe Railroad. Motorists also availed themselves of Harvey establishments, including El Garces, after the construction and marking of the National Old Trails Highway during the 1910s. This highway often ran parallel to the railroad, providing a continuous automobile route between St. Louis and Los Angeles. Whether traveling on the Atcheson, Topeka, and Santa Fe Railroad or along the National Old Trails Highway or, later, Route 66, patrons appreciated the quality of service that Harvey establishments provided. A Harvey-run restaurant or hotel often had the nicest dining facilities and friendliest service in town. El Garces was known for linen and silver, distinctive china, and fresh flowers that it provided daily for guests. The lunchroom had two horseshoe-shaped counters and could serve 140 people. According to the Harvey Girls, who traveled the country to work for the company, El Garces was a crown jewel in the enterprise. An assignment to the Grand Canyon, to Las Vegas, or to El Garces was “like going to Europe.” Community members also used the facilities for private dinners, banquets, and special occasions. Though motorists and railroad passengers alike made El Garces a popular destination through the end of World War II, the waning popularity of railroad passenger service in favor of automobile travel took a toll on Harvey Houses. Automobile travel was accessible to people with a wider range of incomes, who often could afford to travel but not to dine or stay at a place as opulent as El Garces. El Garces closed as a Harvey House in the fall of 1949, at which time the building was partitioned and used as Santa Fe Railway offices. In 1988, the Santa Fe Railroad moved to another facility and closed the building. Abandoned, El Garces was under threat of destruction until a local group formed in 1993 as the Friends of El Garces. The group petitioned the City of Needles to purchase the station, an effort that succeeded in 1999. The National Park Service recognized the building’s significance in 2002, by listing it in the National Register of Historic Places. Though still renovating the facility, the city plans to reopen it as a “Harvey House Hotel,” including a Route 66 museum and shops. 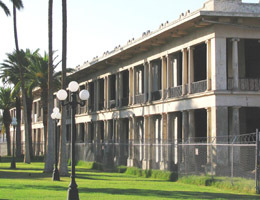 El Garces is at 950 Front St. in Needles, CA, and is currently undergoing rehabilitation to reopen as a hotel with a restaurant and lounge, museum, and visitor center.